Our November-December 2017 fundraising campaign concerning three of our new projects – which are TRIACONTADI project (Project 32), project MISATU (Project M) and Post-REI (Regional Economic Integration) Transitional Capacity Building and Development programme – is still on course. This is the last fundraising campaign of Autumn 2017 before we start the Lights Season. CENFACS welcome any amount of donations to be pledged and given towards these projects. The week beginning 27 November 2017 is the continuation of the last episode of A la Une (Autumn Leaves of Action to Upkeep the Nature in Existence) campaign; episode devoted to Climate Finance and Insurance for the Poor and Vulnerable Children, the Victims of the Adverse Effects and Impacts of Climate Change. CENFACS would like to thank all those who stay engaged, resilient with and continue to support us since this campaign started. The week also marks the end of Skills Development month. The theme for this Year’s November Skills Development has been Digital and Online Skills and Capability. This November has been as well the month during which we started to implement our New Media and Digital Programmes (NMDPs), programmes which took over and extended the Communications for Better Change Programme. The coming month of December is the Income Generation month according to CENFACS Development calendar/planner. 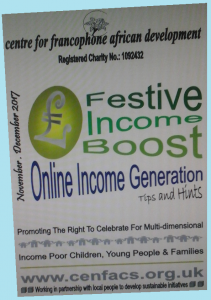 Our Individual Capacity Development Programme (ICDP) booklet entitled “Festive Income Builder and Booster” is indeed designed to consolidate the Income Generation month and prepares us for the New Year’s income relief. 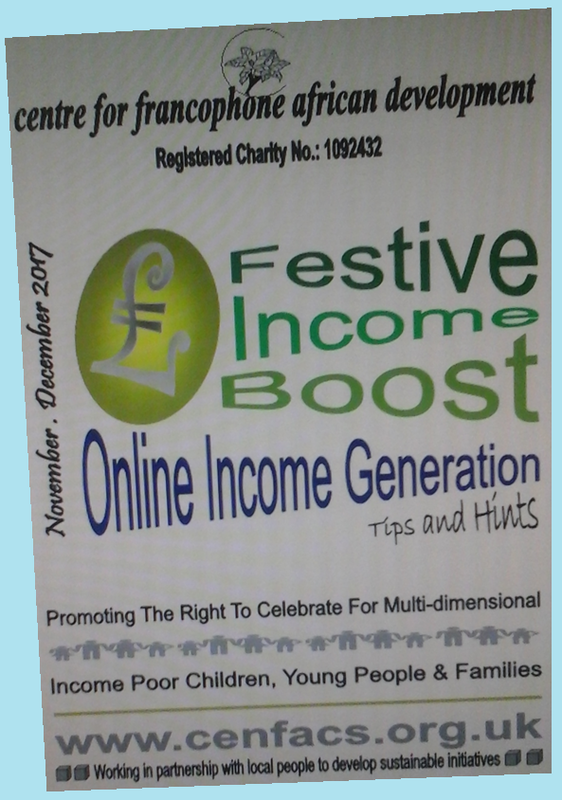 This year’s focus of this seasonal ICDP booklet, the Festive Income Relief Guide, will be on Online Income Generation. The theme of Online Income Generation builds the bridge between our November Skills Development and December Income Generation themed reliefs, between the acquisition and development of digital skills on the one hand and the capacity to apply these online/digital skills on the other hand to generate a little extra income over December, between our ICDP and NMDPs, between our digital capacity and communication. As a key highlight, the resource states that while core sources of income could the most secure and sustainable as they could be a long term solution to the income poverty issue, there are however ways of improving one’s income scope and scale in the short term. This requires one being enterprising and ambitious so that they can make the most of their potentials to capture those incomes that they were losing by lack of awareness and or earn an extra one through their own imagination and courage. online ads and shopping at discounted prices etc. Remember! The resource is primarily and mostly intended to support Multi-dimensionally Income Poor Children, Young People and Families who may also be digitally deprived or not. However, if they are digitally skilled and have overcome digital poverty, they can try to explore the window of opportunities of the online and digital worlds and technologies to build and boost their festive income. Attention! The resource is not designed for those who are looking for big money business or simply big money. For those ones, they can tap into other sources of income available on the market. There are other organisations out there on the market that can assist them. As far as CENFACS is concerned, our mission as a charity is to relieve and possibly end poverty in all its forms and everywhere, particularly but not exclusively in our areas of operation. In doing so, we try to support those living in poverty in the UK and Africa. As a result of our poverty relief work, over the festive period CENFACS try to PROMOTE THE RIGHT TO CELEBRATE FOR MULTI-DIMENSIONAL INCOME POOR CHILDREN, YOUNG PEOPLE AND FAMILIES. This is why the Festive Income Relief Guide exists. The resource is free but a donation of £5 may be asked to cover the cost of producing, updating and posting it. To enquire and or order the ICDP Autumn 2017 Festive Income Builder and Booster – the Festive Income Relief Guide – please contact CENFACS.